Giovanni Cadioli discusses the historical significance of the symbolism adopted by the Donetsk pro-Russian separatists. In 1917 the Bolsheviks rose to power on top of the crumbling Russian Empire. Taking control of Saint Petersburg took them precise planning and one almost bloodless resolute action on the night of November 7. Taking control of what was to become the USSR would take them another four years, during which almost two million lives were lost. That space saw the flourishing of several pro-Bolshevik, short-lived Soviet Republics in south-eastern Ukraine and in Crimea. In the Donbass region, the Donetsk–Krivoy Rog Soviet Republic was established. It adopted not the Bolshevik red flag, but a tricolor. 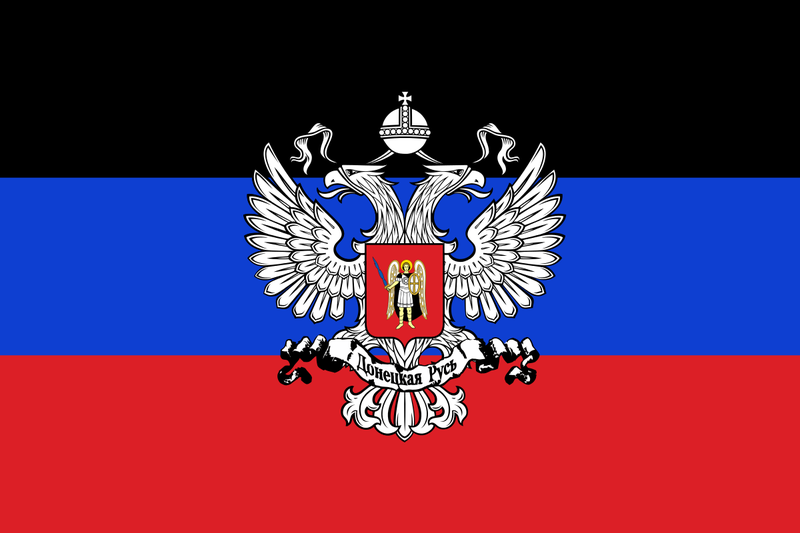 A red-blue-black tricolor – exactly the same flag adopted by the pro-Russian separatists who proclaimed the Donetsk People’s Republic, adding to it a Russian double-headed eagle. The Donetsk Republican organisation, which played a crucial role in the proclamation of the People’s Republic and provided much of its current leadership, is the author of the flag and itself used a slightly different version of the tricolour. Indeed, use of the name “People’s Republic” itself is not casual. Indeed, this name has a profound historical significance: the socialist-leaning, but non-Bolshevik authorities of Ukraine established the Ukrainian People’s Republic, the official predecessor of today’s Ukraine, but the Bolsheviks created a shadow Ukrainian People’s Republic of Soviets, then the Ukrainian SSR. This is hardly the first time flags of the last century have re-emerged in the former Soviet area, with both pro and anti-Soviet significance. The Moldovan breakaway Republic of Pridnestrovie (Transnistria) kept the flag of the Moldovan SSR, after this latter one was dissolved. On the other front, pre-Lukashenko Belarus adopted the white-red-white flag of the short-lived independent Belorussian People’s Republic of 1918-19. The flag is now used by anti-Government protesters. Georgia adopted in 1991 the flag of the short-lived Democratic Republic of Georgia of 1918-1921 – bordeaux with a black-white rectangle in its top left corner. Although the flag was replaced in 2004, the bordeaux flag was often seen during demonstrations against Mikhail Saakashvili. The Russian tricolor and the Ukrainian flag themselves were adopted by anti-Bolshevik forces in the Russian Civil War and resurfaced as the USSR collapsed. 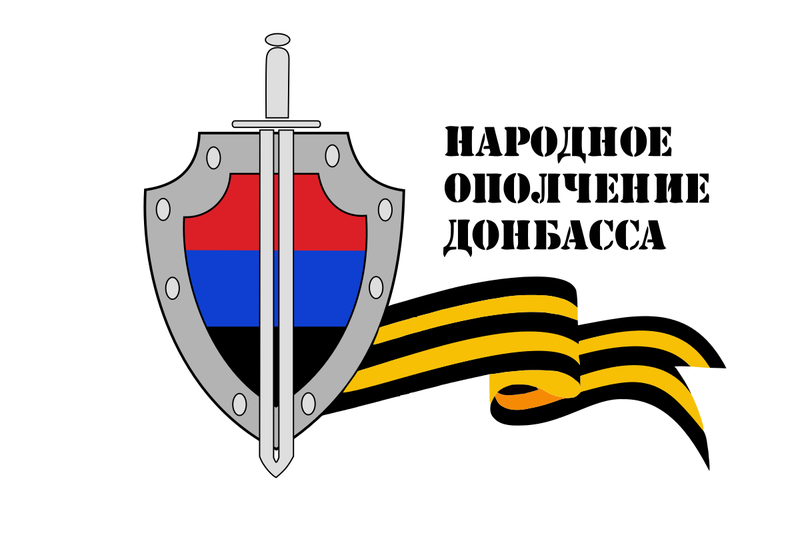 The flag of the Donbass People’s Militia – the Donetsk People’s Republic armed forces – is also rich with symbolism. It combined the tricolor of the People’s Republic, the shield and sword of the former KGB – now the FSB in Russia – and the Saint George Ribbon. Actually, KGB symbolism has enjoyed increasing popularity over the past fifteen years. After the the KGB was dissolved in the autumn of 1991, its shield and sword seemed doomed to a slow confinement to history as the KGB’s successor, the FSK, only sporadically used a heavily modified version of it’s predecessors’ symbology. However, the KGB was never dissolved in the Georgian breakaway republic of South Ossetia, or in Belarus, where Lukashenko, who won the 1994 elections, started a process of general reintroduction of Soviet symbology. Transnistria recently joined this “KGB club”, while the Russian FSB adopted the shield and sword in 1998, substituting the hammer and sickle with the double-headed eagle . Several other Russian military and intelligence agencies, as well as military units, adopted or kept the sword and shield. Moreover, KGB-like symbols remained in use or were reintroduced in several former Soviet Republics by the CIS Anti-Terrorism Centre. As for the Saint George Ribbon, this small black-orange ribbon represents perhaps the most striking element of continuity between the Russian Empire, the Soviet Union and the Russian Federation. The colours of the ribbon were mounted on the Tsarist Order of Saint George, re-adopted by Stalin for the Soviet medal celebrating the Victory over Nazi Germany and for the three-class Order of Glory, and in present-day Russia represent the most widely acknowledged symbol of the victory over Nazi Germany (and are mounted on several Orders and Medals). Moreover, black-orange was also the colour of Tsarist soldiers’ cap badges and is now the colour of Russian ones, where however, also a Soviet-styled star found place. The Saint George Ribbon has also become a symbol of pro-Russian sentiments across the former USSR and in a particular way in Ukraine, since well before the current crisis. Therefore, the symbolism adopted by the Donetsk People’s Republic is yet another glaring example of the highly politicised use of history in the former Soviet Union and of its crucial role in the Ukrainian crisis. Interestingly, the Russian Ministry of Interiors (MVD) kept at first the Soviet MVD sword and shield. Later on, while the FSB reintroduced the KGB sword and hammer, the Russian MVD adopted a double-headed eagle as its emblem. Woha, Thank you amigo for this one i really like it.